The Molotov Cocktail in GTA IV. Carl Johnson about to throw a molotov in GTA San Andreas. 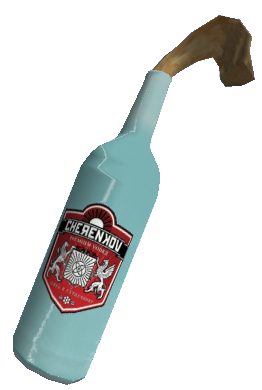 The Molotov Cocktail is an incendiary weapon first introduced in Grand Theft Auto 2. Used to set a small area on fire, the Molotov cocktail is based on the real-life "home-made" Molotov cocktail, which is prepared by inserting a rag into a partially filled liquor bottle, allowing the rag to "wick up" the flammable alcohol or other volatile liquid within. This causes the soaked rag to become flammable itself, allowing it to be lit on fire. Because the fumes from the flammable liquid (which are actually what catches fire, not the liquid itself) are contained within the bottle, full ignition does not occur until the glass container is ruptured, allowing the fumes to escape. This normally happens upon impact of the Molotov against a hard surface, after being thrown. It can set a group of pedestrians on fire or light a car's engine on fire, causing it to explode. Victims on foot will catch fire and die if close enough to the flames. In GTA2 molotov doesn't set fire, but explodes. Use of the Molotov will normally result in at least a 1-star wanted level. It proves to be one of the most deadly weapons for the player when used at close range. It is one of only two weapons which can destroy a tank, the other being a Flamethrower. In Grand Theft Auto: Vice City Stories the Molotov is more effective and can destroy a vehicle rapidly fast after one cocktail being thrown at the vehicle (providing the vehicle is in the inner circle of the blast). 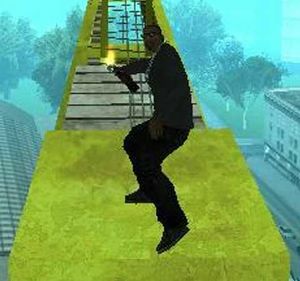 In Grand Theft Auto: Chinatown Wars, the player can use the touch screen to throw Molotov Cocktails at a distance in any direction. Huang Lee can go to gas stations marked in the radar to fill up bottles of gasoline to use as Molotov Cocktails. A minigame is associated to this with the player using the touch screen to aim the gas nozzle to the bottle and shoving a cloth into the bottle. When you have it held in you in GTA San Andreas in front of the mirror, the fire does not show up. Mike throwing a Molotov Cocktail. CJ throwing a molotov cocktail. Making a molotov in GTA Chinatown Wars. A multiplayer character throwing a molotov. Saint Mark's, Portland - Inside the abandoned rail tunnel (that runs underneath Saint Mark's) just southeast of 8-Ball's Bombshop in Harwood. To obtain them, simply kill the four people inside. A Hidden package will be in the center of their 'circle'. Pike Creek, Shoreside Vale - Available to buy in the unnumbered garage at the back of the police station after completion of A Drop in the Ocean ($2,000). Downtown - At the Tacopalypse restaurant across the street east of the Hyman Condo. Perhaps the secret ingredient to their hot sauce? Vinewood, Los Santos - To the right of the Express Hobos Limited diner in the northeast portion (directly west of the 24/7). Ocean Docks, Los Santos - To the right of a short street that connects to Los Santos International Airport, underneath a building. East Los Santos, Los Santos - In an alleyway , north of Cluckin' Bell. Ganton, Los Santos - Inside the kitchen of the Johnson House after spraying all 100 tags. Palomino Creek, Red County - At the southwest corner of the rooftop of the red brick building at the southwest edge of town. Flint Range, Flint County - If you date Helena Wankstein, you can gain access to here tool shed in Flint Range. A Molotov Cocktail is one of those weapons inside the shed. Creek, Las Venturas - At the shopping center, on the roof at the very southern edge. Come-A-Lot, Las Venturas - At the north end of the, on the roof of the tan brick building at the southwest corner of the intersection one block east of The Camel's Toe pyramid. Fort Carson, Bone County - Next to the dumpster behind the P Hat Liquor store at the south end of town. It can also be spawned using a cheat code. Red Light District, Portland - In the ruins off the Dolls House after the mission Blow Up 'Dolls'. Shoreside Vale - By some tables in the picnic area near Wichita Gardens. Molotov Cocktails can be purchased at the back-alley gun shops for $500. They can also be purchased from Little Jacob for $350. Being hit by one on multiplayer is not a death sentence, because you can pause and will not take fire damage while the flames begin to extinguish. However, you can still be killed, stabbed, shot, or otherwise hurt. They can be used from cars, but it is diffucult to do so as the Molotov would have to hit the target directly. A couple Molotovs will flame up a car also, while four will set it ablaze, and six will completely destroy it or render it inoperable. Firefly Projects - Can be found on the west side of the projects off Cokanuk Ave.
BOABO - Can be found in an underground dock on the water's edge off Chicory St. This pickup is relatively difficult to obtain due to its location. Acter - Can be found in a grassy area next to a tree behind some houses north of Moog St. In Grand Theft Auto IV, there is a glitch that exists that involves the Molotov Cocktail. If the player lights themself on fire with the Molotov prior to jumping off or falling off a building, regardless of the height, they will survive the fall, but lose a large amount of health and armour in the process due to the fall and fire damage when they would normally be wasted instantly. This glitch, however, only works sometimes. This page was last modified on 30 March 2014, at 07:35.